What is your typical pick for a morning meal? Do you make time to prepare a balanced breakfast of protein, fat and carbohydrates or do you like it easy on the most important meal of the day? Do you just grab a cup of coffee with toast and go? While some breakfast choices are better than others, eating a quick breakfast is better than skipping it. Now on its 7th year, the latest Nestlé Expo focuses on the importance of a healthy breakfast in achieving personal success, the very same theme of Nestlé Philippines’ Nutrition, Health and Wellness advocacy this year. Wellness Breakfast is driven by the important role the first meal of the day has in terms of nutrition, according to SVP and Director of Communication and Marketing Services Paolo Mercado. And Nestlé makes it possible to prepare healthy breakfast that are simple, complete and easy to pack. 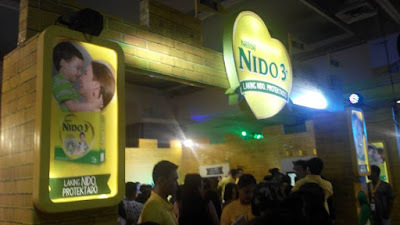 This much awaited annual event is a dynamic celebration of wellness that draws over 30,000 visitors and is a major component of Nestlé’s long-term advocacy to promote Nutrition, Health and Wellness (NHW) among Filipino families. “Nestlé’s ‘My Wellness Plate’ teaches that half your plate should be ‘glow’ foods (fruits and vegetables) and the other half should be a combination of ‘go’ foods (carbohydrates) and ‘grow’ foods (proteins), accompanied by a healthy beverage. 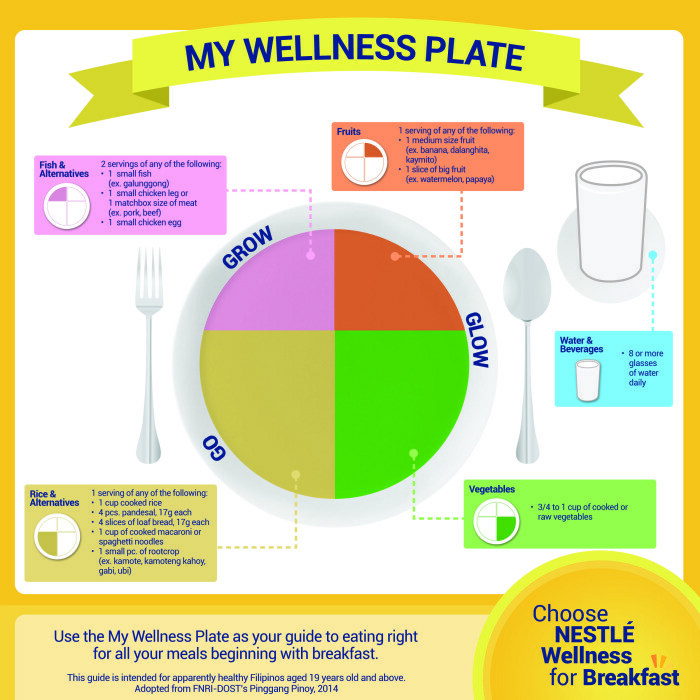 Nestlé recommend that the principle of ‘My Wellness Plate’ be followed in every meal, starting with breakfast, for one to be able to meet his or her nutritional needs,” Mr. Mercado said. 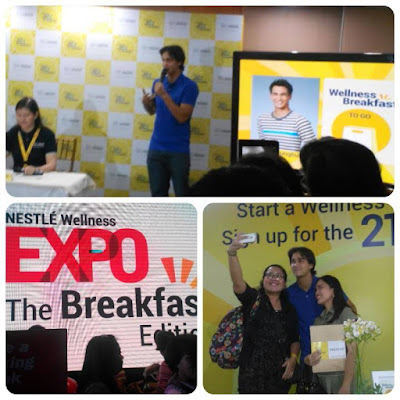 The Nestle Wellness Celebrity Ambassadors Dani Barretto (fashion and lifestyle blogger), James Younghusband (professional athlete) and Nicole Hernandez-delos Angeles (former model and mom) were introduced during Wellness Expo Presscon held last July 4th. 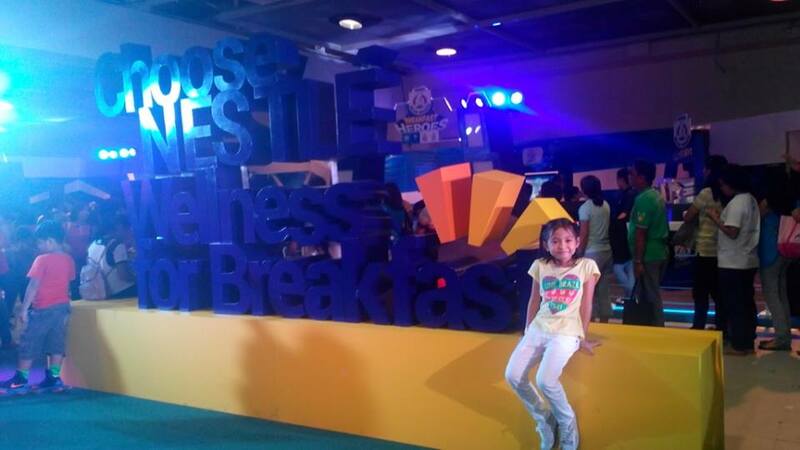 Nestlé is launching the 21 Mornings Program come July 8,2015 to highlight the importance of breakfast in kick-starting your day. 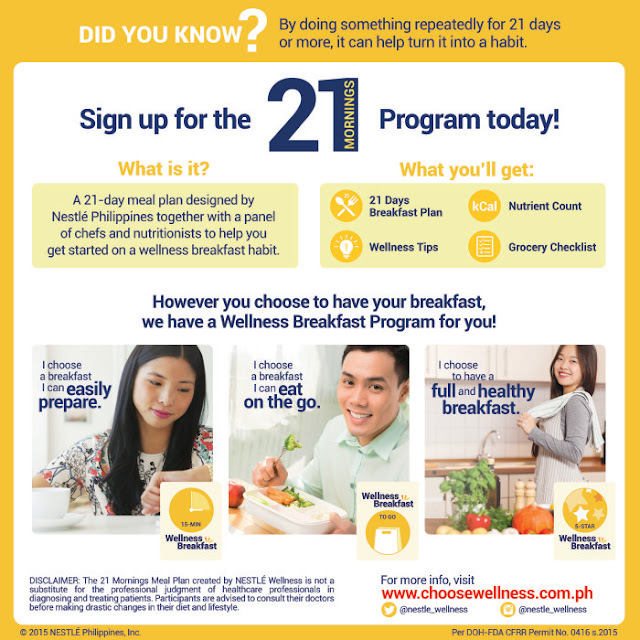 This is a 21-day breakfast sampling activity designed by Nestlé Philippines chefs and nutritionists to help you get started on a wellness breakfast habit. The 21 Mornings Program will visit selected venues to provide free nutritional consultation and promote awareness on various breakfast options via the Wellness Breakfast Truck. 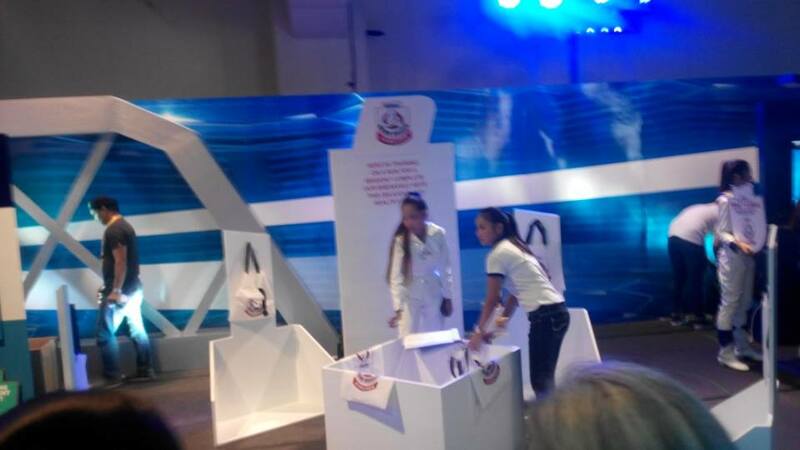 Nestlé Brand Ambassadors will be there to help consumers learn about the benefits to eating a healthy breakfast and entice them to sign up for the 21 Mornings Program, which the Wellness Breakfast Truck offers. The first 500 consumers who lines up at the Breakfast Truck on different locations will get a free breakfast (their choice among 15-minute Wellness Breakfast, Wellness Breakfast To Go and 5-Star Wellness Breakfast) plus a Nestlé beverage. Do visit the Nestlé Choose Wellness website at www.choosewellness.com.ph to know more about the Nestlé 21 Mornings Program. Thanks to Nestle, ang kalusugan ng batang Pinoy ay matutugunan na. This 21 Morning Program really put awareness for healthy breakfast to the max. Share this post to my daughter since Batang Nido yung apo ko. 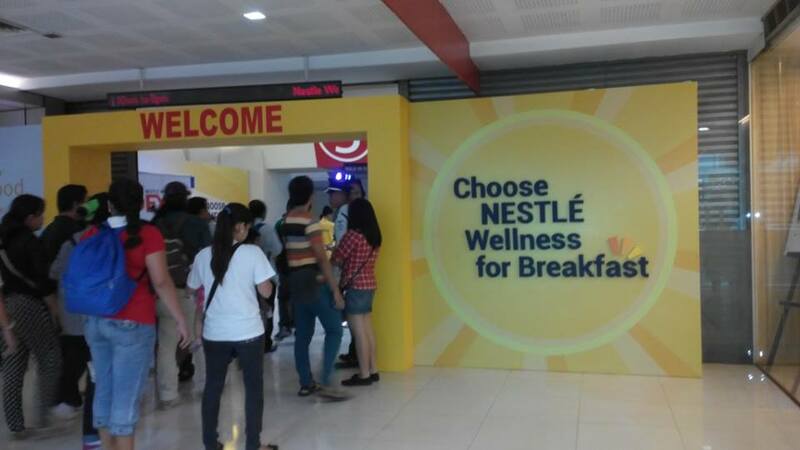 Through Nestle, many Filipinos now are aware on the benefits of eating breakfast. Salute to this great advocacy! This simplifies the requirement for a healthy food. The plate allocation can really help you find the right balance of nutrition. I'm doing this kind of a program, Don't skip breakfast and always drink water. I love Nestle product, especially their cereal rich in fiber. You have provided the useful and helpful diet chart. I like the way you written the post on wellness breakfast. You have raised such great points to think about. Thanks for sharing.